These beautiful diamond piano finish wood awards with brass metal base are eye catching and stunning. 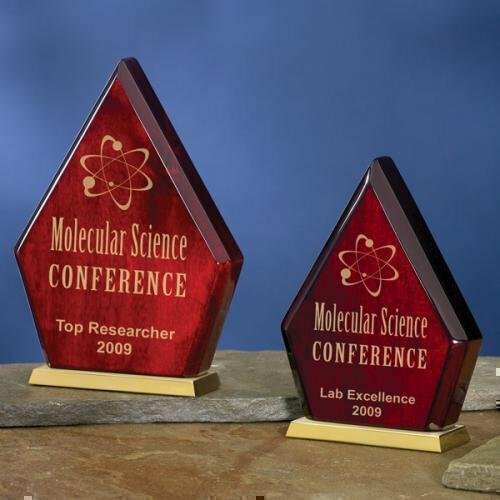 The larger diamond wood award shown on the left measures 6 1/2" wide x 1 7/8" deep x 8 7/8" tall. 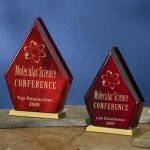 The smaller diamond wood award shown on the right measures 5 1/2" wide x 1 7/8" deep x 7 3/8" tall. Plenty of room for engraving. Perfect for employees, achievement, sales person, or any award or trophy presentation.